Community support has been instrumental in getting a sustainability program implemented at Salisbury School, a 300-student boarding school for high school boys in Connecticut. When the foodservice department went self-op three years ago, Tony Fraenkel, director of dining services, says he was able to answer demand for an environmentally friendly dining service. One of those partnerships is with Weatogue Farm, which is less than five minutes from campus. The farm is owned by Gordon Whitbeck, a school alumnus. A faculty member put Fraenkel in touch with Whitbeck, and now Fraenkel purchases produce grown on the farm for use in his dining program. Fraenkel also gets local produce from the Salisbury School Garden Project, an on-site garden spearheaded by community members. The garden’s caretakers ask what produce Fraenkel can use in his program, and “the foodservice department reaps the awards,” Fraenkel says. Another local partnership that has helped with the school’s sustainability efforts is purchasing cattle from Shady Maple Farm, which is located next to Weatogue Farm. Fraenkel found out about the cattle farm from another community member. “It’s very rural here and everyone seems to know everyone,” Fraenkel says. Fraenkel purchased three head of cattle this year. 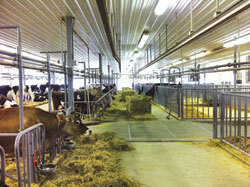 The cattle is processed at a local USDA slaughterhouse to Fraenkel’s specifications. Fraenkel says he gets between 600 and 650 pounds of meat from each animal. He orders cuts of meat that can be roasted and braised, in addition to ground meat. “It’s nice to know where the beef comes from,” Fraenkel says. In addition to local purchases, Fraenkel has implemented trayless dining to cut down on waste, is using only 100% compostable paper products in the dining room, is converting cooking oil to biodiesel and is composting 75% of food waste, which is used on a local farm.